Our Top Sellers are sure to be a favorite by all. We have so many air fresheners but these will surely be the top of the pick. 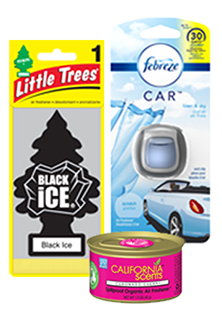 Some of the air fresheners are Little Trees, Yankee, Ozium, Citrus Magic, California Scents, Refresh, Scent Bombs, Febreze, and many many more. Get yours now! We have the lowest prices in the nation~GUARANTEED!